I run raku workshops with fellow potter Mark Compton throughout the summer months from April to October. Raku is a pottery firing process developed in 16th century Japan for the Japanese tea ceremony. The pieces are glazed, dried and put directly into a hot kiln outside where they remain for about half an hour until the glazes have melted at a temperature of approximately 1000°c. The pieces are then removed from the gas fired kiln with long Raku tongs, put into a nest of sawdust and covered with a metal cover - creating a reduction chamber. This reduction atmosphere changes the molten glaze to produce the most wonderful colourful, lustrous crackle glazes which are associated with Raku Pottery. 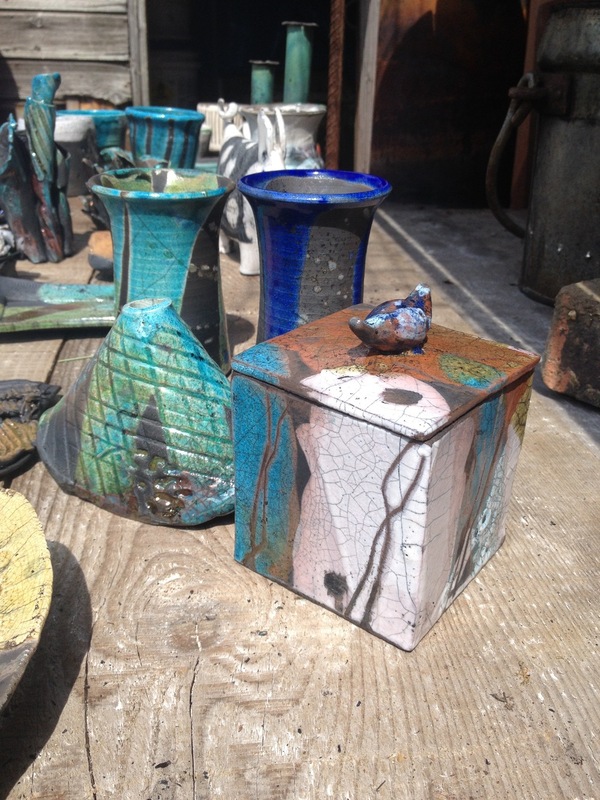 Raku firing is one of the most dramatic and exciting ways to fire pottery!!! No previous experience is necessary - we make biscuit fired pots/dishes that can be bought on the day from £5 each or you can bring up to 8 pieces of your own biscuit fired work (depending on the size), so even if you don't have any pottery experience you will have a great day and take home some beautiful raku fired pots! Saturday 13 April Saturday 27 April Saturday 18 May Saturday 13 July Saturday 27 July Dates for August - October will follow later in the year. Sign up with your email address to receive the M & K Raku newsletter. We will respect your privacy and only send you news on M & K Raku and our pottery workshops.